For the last day of school, I wanted to bring all of the Kindergartner’s one last treat for the year. I was the room mom and tried to bake a cookie or cupcake for every holiday or occasion throughout the year. Since this was not really a themed event, like St. Patrick’s Day or Christmas, I decided to just play around with color. I have noticed that 6 year olds are really into crazy colored food. Have you seen the scary neon green yogurt? I have quite the collection of food coloring and some new colors that I had never seen in action. (I really don’t know what I am going to do when I do not live so close to Cake Castle. Probably have a lot more money that is for sure.) This is the perfect job for that. I used a basic sugar cookie dough, my favorite one, but you could easily use a pre-made dough. I promise, I will not tell. 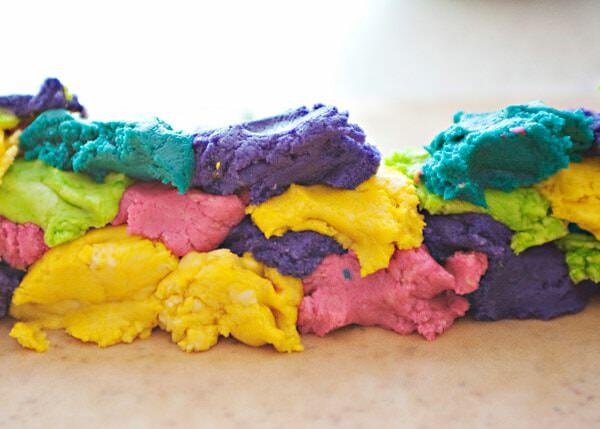 I let William help me pick out the colors and mix it into the dough. Even Daddy got in on the cookie making fun and helped mix the food coloring into the dough. These were seriously easy, seriously fun, and seriously a hit with the Kindy crowd. Excuse me, now 1st grade crowd. 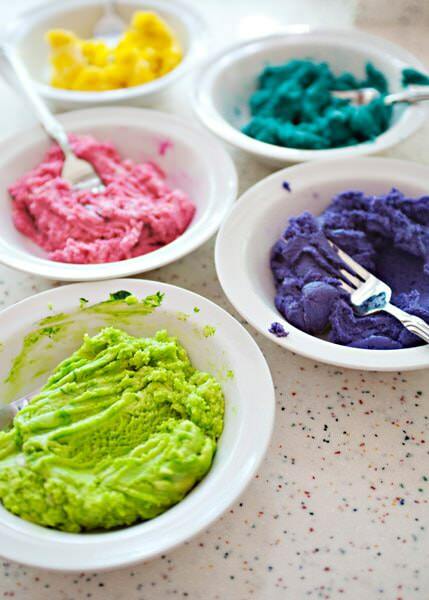 Separate the dough into as many bowls as colors you want to make for the cookies. Work in as much food coloring as need to get the desired color. I am guessing about 1/4 to 1/2 teaspoon food coloring per bowl. Quality control again. They mean business around here. 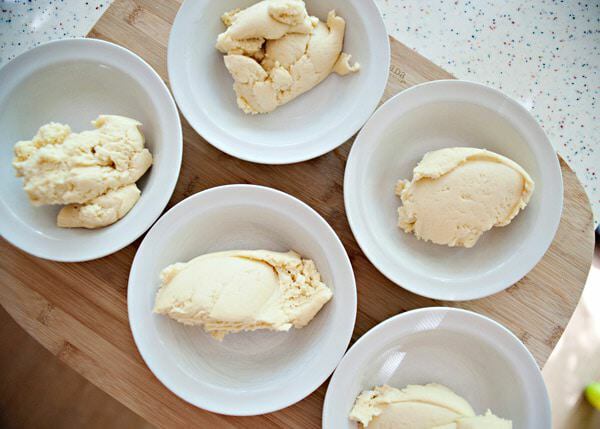 Pinch off pieces of the dough and form a loose log shape on a piece of parchment paper. We did some really little pieces and some larger for variation in the dough. Roll up the cookies in the parchment to form a log. Chill the dough for about 2 hours or until firm. Slice into 1/4 inch slices and bake according to the recipe. How fun are those? They turned out even better than I imagined. I love it when that happens! These two think that they taste pretty good too. This picture just makes me laugh. He is so cute sometimes it hurts. Ava thought that the cookies matched her dress. She thought that I did it on purpose just for her. This would be a really fun thing to do on a hot summer day in the cool A/C. 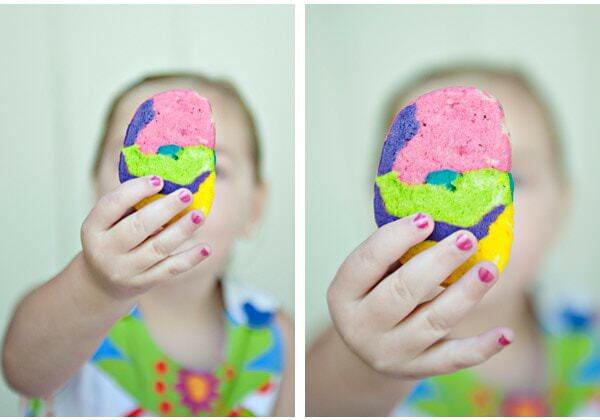 These tie dye cookies were fun to make and fun to eat. You know that I love to cook with my children and this is a perfect thing to make with little people. These cookies have a lot of possibilities for other occasions too. Customize the colors and they would be adorable. How about red, green and white for Christmas? These are ADORABLE!! I love them! Such a cute idea! 1. I was just about to ask if you make them wear clothes that match the food when I got to your sentence about Ava. That made me laugh. 3. And yet I find that I have to make these. 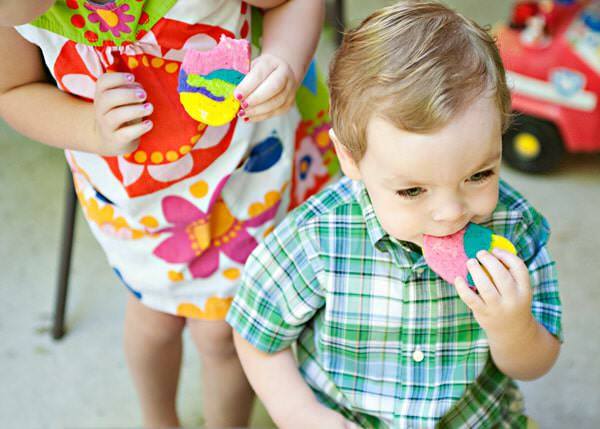 My kids clothes won’t match the cookiesâ€”they can’t even match their shirts with their shorts. But these are absolutely fun! And WAY easier than cutting out sugar cookies. I’m all about simple! food coloring can wig me out too. The amount is so small for the impact. My kids will eat more things when they are funky colors, so I let me weirdness over the food coloring go. Now I have a collection of gel food colorings in my pantry. Have fun and take some pictures! These look so fun Bree! The kids asked if I can make them right now when I showed them the picture. lol…will definitely try the recipe. My 7 year old niece saw your email and got all excited about the cookies! We will make them on her next visit! Oh my, how kid-friendly! They must gobble these cookies up! they were really fun to make too. 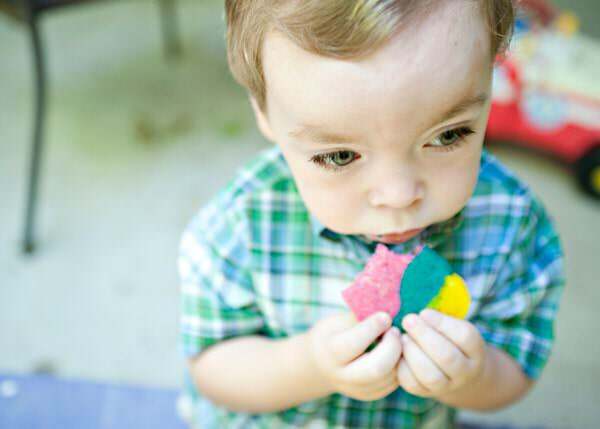 I agree that these cookies are majorly kid-friendly! How fun! It all looks like edible Play-doh! YUM! 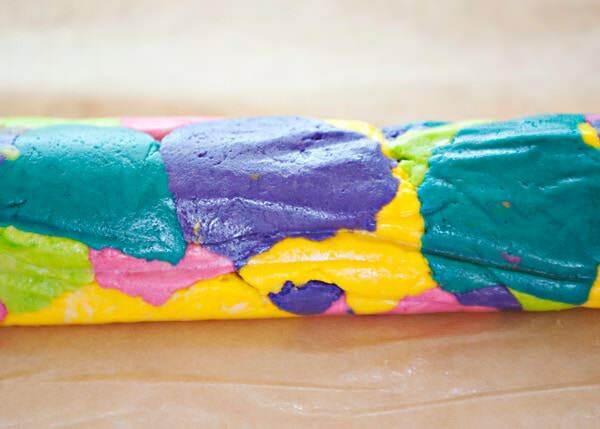 Now I want to make Play Doh with the kids, they had so much fun making these. OH MY GOSH! These are adorable! I want some.. RIGHT NOW!!! they are cute AND taste good. My kids are going to be tie-dying t-shirts this week. I think your post is a sign for me to make cookies to match the occasion! can we play at your house? Sounds like a fun day! These baked up perfect. 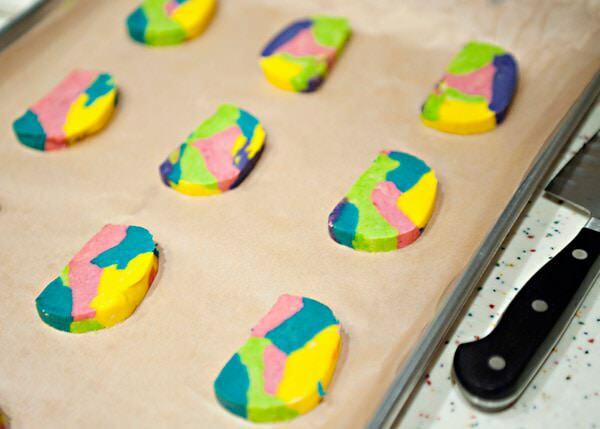 We are now calling them play-dough cookies! Aren’t they fun? So glad that Alice liked them. Love your site. Had a question about the sugar cookie dough recipe. I know you said using butter extract was optional, if I leave it out since I don’t have that ingredient on hand will it make the cookie taste different? This is just brilliant! The girls and I had a blast making them. Thanks so much for sharing with us. Aren’t they fun? I think that they would be perfect for Christmas in red, green and white. In addition to the cookies looking very tasty, your shots are beautiful! What camera do you use? thank you Abby, I use a D700. More info under the photography tab. Everyone loves a fun cookie. Thanks for the super fun recipe. We had such a great time making these yesterday! Also, I can’t get over how tiny your kiddos are in this post! I know! They have gotten so big. I am so glad that you guys had fun making these. Yours turned out so much prettier than mine! Just happened to stumble upon this recipe and am OBSESSED! I have been looking for a great recipe and this is my new favorite! I used more neon colors to make mine and they came out so bright and beautiful. Have you ever made a cookie cake with this recipe? I need to make one for a birthday but have no idea how long to bake them and at what temp. Would you know? I have never made a cookie cake, but I am sure that there are a million recipes out there for it. If you would like to display a featured button on your site, you can grab one from the right side bar of your post above. Thanks for a wonderful dea! 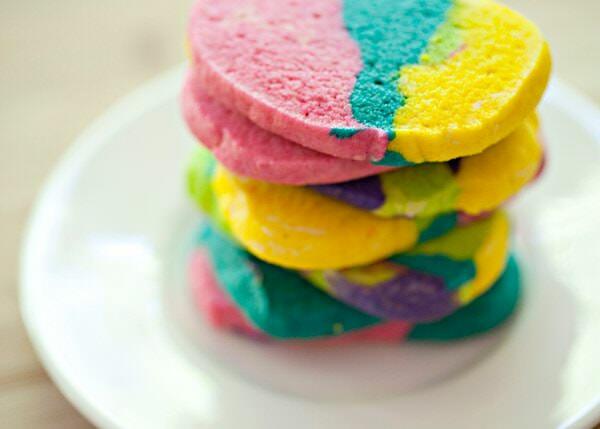 I like the fun look of these cookies, and even though I live in, and work in, a strictly adult world, my professional coworkers-with-childlike-minds would truly enjoy these! We work in the Intensive Care Unit of our hospital (the unit has earned its name, trust me! ), and lately we’ve seen an increase in many sad things; I think it’s time to bring some happy colors–and some great taste–to the unit. I’m thinking that I”m going to put cream cheese frosting on them, then top that with bright-colored candy sprinkles–oooh, better yet, mini M’s! Love M’s!! 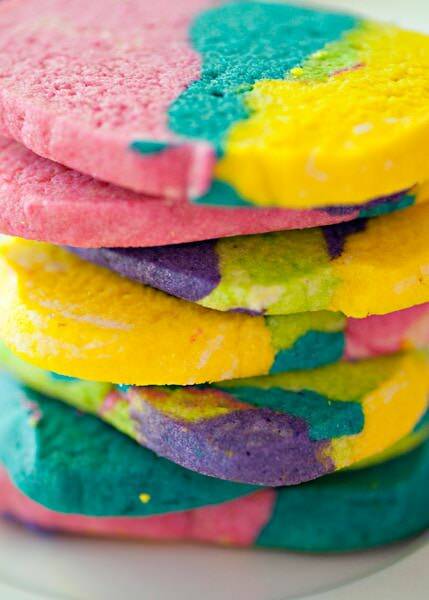 Thanks Bree, for the recipe and colored dough idea; this will be utterly fun for all of us here!!! Yes! 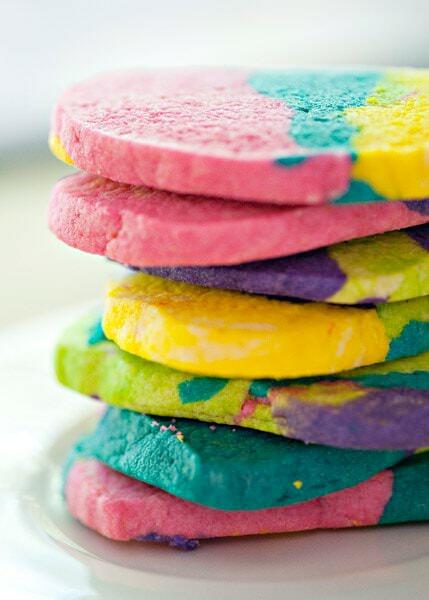 Tie Dye cookies have to make people smile! This is such a great idea. I am thinking red and green cookies for Christmas! I’m a mom with 2 little girls at home, 6 & 8. Being an over the road truck driver, my time at home with them is precious and I always try to do something fun. This is perfect! 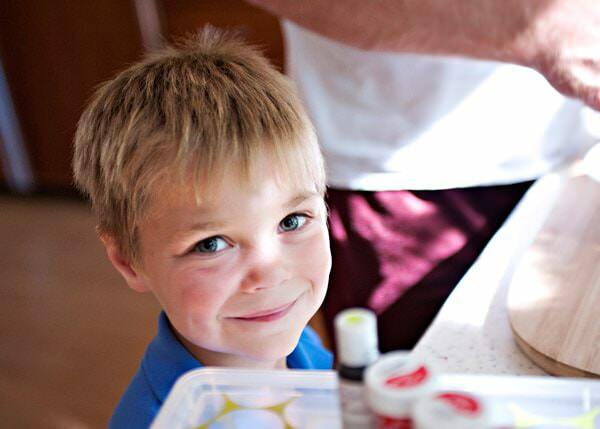 They love to get in the kitchen with me to make anything and these would be another wonderful memory! This is a great activity for you then. Something to DO and something to EAT. these are so cool ! I made theses for my school bake sale and they sold out in two in hours. I’m making these for my teacher book fair preview! The theme is peace love and books 🙂 I used your sugar cookie recipe. Question, it says chill over night and then you say to chill two hours after you make the tie dye log, or should I only chill once? 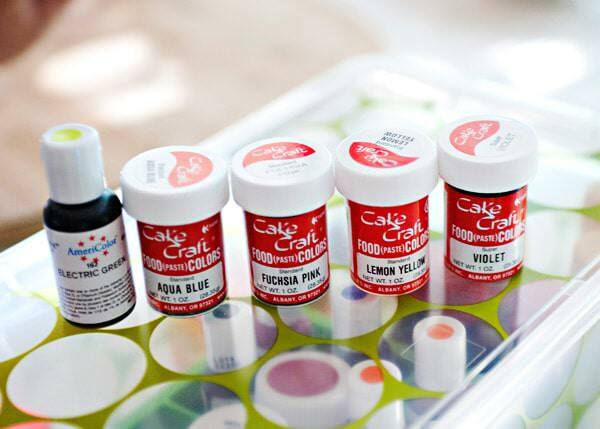 I was going to chill it plain overnight and color and bake in the morning… What should I do? That should work, you need to chill the log so that you can slice it cleanly.